Located 16 kilometres south of Trenčín on a 30 metre-high cliff above the village of Beckov, Beckov Castle was built in the late 12th century as part of a chain of royal castles protecting the western Hungarian borders in the Váh Valley. In the 14th century it passed from the crown to the Stibor family, who carried out extensive reconstruction work. This Renaissance reconstruction can be seen from afar today in the arched attics on the perimeter walls of the palace and the Gothic chapel. The castle later passed to the Banffy family, who owned the castle until 1646 when the male heirs died out and the estate was divided between six families. Thereafter, lacking proper maintenance, the castle fell into decline until 1729 when it was destroyed by fire. 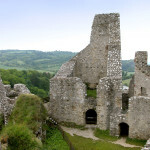 In 1996 archaeological work was carried out and the ruins of the castle were reconstructed, strengthened and opened to the public. Visitors can still see rich Gothic and Renaissance decorations and also the excavations carried out by the Monuments Board of the Slovak Republic. 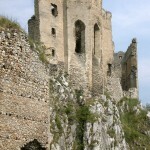 An exhibition on the history of the castle and its famous personalities may be viewed at Beckov Museum.